Muchinga Presbytery joined other presbyteries in the country in launching the Golden Jubilee celebrations on 2nd March 2014 in Mpika. The Boys Brigade and youth groups led the march past which was also attended by ten consistories led by their respective Chairpersons. The march past started off from the Presbytery office to St. Margaret’s congregation where a Church service was held. The Presbytery Bishop addressed the congregants and spelt out the purpose of the gathering. He urged all consistory Chairpersons to prepare for the launch in their respective consistories. 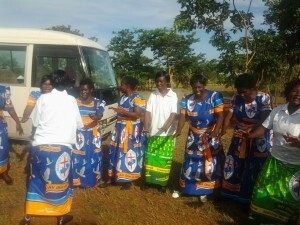 Minister-in-Charge of St Andrew’s Congregation in Lusaka, Rev. Alex Mwalilino, preached on the theme: “Unity in Mission”. He highlighted the importance of team work and the need to remain as one, being members of one church. He also encouraged congregants that as the church focused on the Golden Jubilee celebrations to be held in January, 2015, “our celebrations should be focusing also on evaluating ourselves from the period we came into being as a church and to be projecting the future of our Church”. The Launch went on well and the attendance was good. The march past was flagged off at 09 hours by Mrs. Gift Siwakwi, a member of the National Golden Jubilee celebrations Committee from Lusaka, after the Guest of Honour, the Provincial Minister, did not turn up.